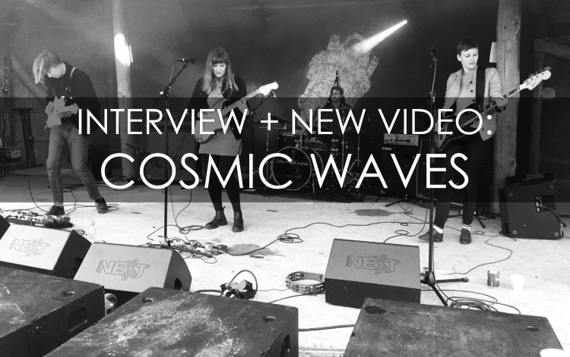 Your resource for all things shoegaze and dream pop: INTERVIEW + NEW VIDEO: Cosmic Waves. Lasse: I think that there are many great artists around from those particular scenes. Martin: The Underground Youth is one of my favourite bands – their music means so much to me. Lisbet: I would also go with The KVB, Flyying Colours and Cold Showers. Lisbet: Reverb and chorus are the heart to my guitar sound, while other pedals are more of a secondary importance. Martin: I always play on the bridge pickup position of my Fender Stratocaster. Pedal-wise, I never switch off the reverb, delay and chorus. I switch settings on the delay pedal depending on the songs though. For noise, I use a vintage Pro Co Rat and a Death By Audio Fuzz War. For our EP, I recorded all my guitar parts through a bass amp, to get that deeper and darker sound I was going for. Mia: Some delay, and distortion for the rough parts. Martin: In the beginning, we just recorded our songs with a mobile phone and later added overdubs and vocals on GarageBand. You can imagine that the result wasn't the best. Lisbet: Luckily, I was fortunate enough to meet the amazing producer Joël Krozer on a night out a few days after I had moved to Denmark. He took us under his wing and agreed to produce our EP Cosmic Waves. The EP was recorded on the Danish island Bornholm, in a small church which had been turned into recording studio. The high roof added a great reverb and echo sound to our songs. We used a sixties Gretsch drum set, a sixties Hagström guitar amp and some really nice vintage microphones provided by the studio, but other than that we pretty much used our own gear. Martin: We haven't dealt with the corporate music industry yet. So far, we have been quite a DIY band, so it's quite difficult for us to say. 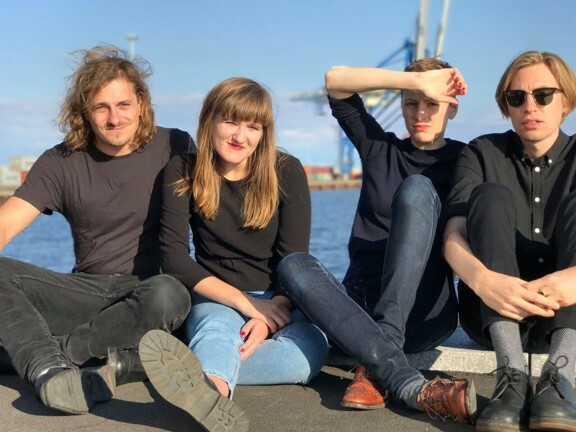 Martin: I am a big fan of Bandcamp, as it made it possible for us to release our EP to a big audience, while maintaining complete artistic control. When it comes to physical releases though, I feel that it is vital to have a label that can help you out from a financial and organizational perspective. Martin: There is no doubt that streaming comes in so handy when it comes to accessibility and discovering new music, but nothing is ever going to beat vinyl. Mia: Agreed. Vinyl is incomparable with other formats. Lasse: CDs for me, all the way! Martin: To mention everybody would probably add up to a small encyclopedia, but if I had to cut it down here and now, I'd have to pick Sune Rose Wagner from The Raveonettes and Craig Dyer from The Underground Youth. Sune might be my favourite guitar player of all time and I love the songwriting of Craig Dyer. Then there's the simplicity of Spacemen 3 and the sound of The Cure which I have been very influenced by. I'd also have to add Dee Dee Ramone, Bob Dylan and Leonard Cohen, as those are the people who inspired me to start writing my own songs. Otherwise, the literary worlds of Franz Kafka are vast sources of inspiration. Martin: I've just finished the new Twin Peaks season which I absolutely adored. I also just started reading Mark Frost’s The Secret History of Twin Peaks. As you can tell, I'm quite a Twin Peaks fan. Otherwise I listen to a lot of Nick Cave and the Bad Seeds and Warpaint at the moment. Mia: These days I dig into a little feminist study concerning female perspectives on life – also the foundational question about if that perspective is something in itself at all. Besides philosophical classics such as Simone de Beauvoir, Judith Butler, and Shulamith Firestone, I must also mention A Room of One’s Own by Virginia Woolf. Martin: It is hard for me to define the Cosmic Waves sound by only naming one song, as it is quite difficult to compare a track like "Dead Night" to "Sun Doom" or "Wild Flower" to "Darkest Hour". Mia: Two of us would go for “Sun Doom”; meanwhile two of us would go with “Darkest hour”. Please listen to both and get back to us. Lisbet: Usually Martin or I come up with the base of most songs, which we take with us to the rehearsal space. From there on, we go more into depth with the sound and structure and finalize the songs. Martin: I write and compose a lot when I am alone. Often, while jamming at home by myself, I end up stumbling across a certain sound or melody that I keep returning to, and from there onwards, I try to develop it into a song. Lyrics are written almost simultaneously and in the heat of the moment, with a bit of editing afterwards. Lisbet: Rules are made to be broken?